Long ago and far away, when one of my loan officers would rush into the office saying, “We need a lot loan” or “Company XYZ can do seconds!”, my reaction would normally be to try to calm the speaker and explain how we really didn’t need that product. Occasionally, that worked. But I often lost sales people to competitors who had a broader mortgage product offering and lots of “bells and whistles” for clients, because that’s what they wanted. Those days are essentially gone. One reason is because the days of unique mortgage products, and risk-taking home buyers who wanted many of them, largely went away in 2007 and 2008. But the other reason is actually much more positive and has produced good results according to the real estate lawyers The Woodlands division. Most lenders now have ‘correspondent’ relationships which allows them to use products offered by other mortgage companies. The same loan officers described above are now yelling, “We need to sign up with Company ABC right away. Wait until you hear what THEY have that we can use!” But it may now never get to that. Lenders have better ways to learn ‘who has what’. One of those ways is by using Mortgage Elements. And that’s how it was started. The website was created and designed by mortgage industry veteran Mark Paoletti. But it’s not just for brokers now. 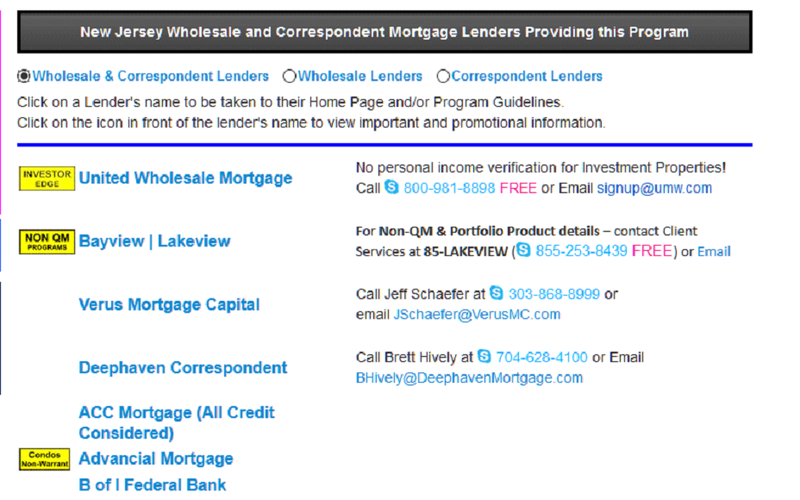 As reported in the National Mortgage Professional in May of 2014, “The website contains links to different Wholesale/Correspondent lenders' websites. These links help to research the various loan programs. 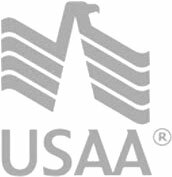 The amount of information available on the lender's public facing web pages varies according to the preferences of each lender.” Refinements and updates are expected to continue. So let’s examine the Pros and Cons as they appear to exist today. ⦁ Use of the site is free for all mortgage professionals. This is helpful for the former-me when it is necessary to find a lender who offers something you don’t. Further, listing in the website is FREE for all Wholesale and Correspondent lenders. Either the lender provides the information or the website posts what is found in other public websites. ⦁ The website, after the first use is EASY and consists of just a few clicks with a mouse or on a tablet or smartphone. ⦁ There are some impressive partners, including Rob Chrisman, TheTruthAboutMortgage.com, National Mortgage Professional Magazine, Northern Illinois Real Estate Magazine, Mortgage Manuals, Mortgage Help Desk, and Mortgage News Digest. ⦁ There are links to nearly 100 mortgage-related associations such as both the Mortgage Bankers Association of New York as well as the New York Association of Mortgage Brokers and this is the case for other states. There is also access to the Divorce Lending Association, the Community Home Lenders Association (CHLA) and numerous other possibly helpful sources of information or assistance. ⦁ Similarly, there is a tab for nearly thirty mortgage resources such as HUD Lenders Page, Markets Overview - Bloomberg, Fannie Mae Loan Lookup and the FHA - HUD Approved Condo Projects. ⦁ Included are companies who offer some specialty products that are definitely not “standard” at most lenders. ⦁ Mortgage Elements is well represented on the internet. You can find it on Facebook, LinkedIn, Pinterest, in an article at realtor.org, on Google+, at zoominfo, and even referenced in scamadviser,com (they got a “High Trust Rating”). ⦁ There is an on-site option to sign up for “Alerts, Announcements, and Economic Calendar”. ⦁ The very first time someone told me about this site a few years back, I must admit, I could not immediately determine how to use it. And, yes, I have a PhD. Once I was walked through it (and squelched my humiliation) I realized I just FIRST needed to click on a program from the table, enter a state, and hit “Go” – above or below the table. What had confused me, I rationalize, is the very top box (no, not the very clear instructions in the box that screams for me to choose a state from the drop down). Yes, reading is, in fact, fundamental. ⦁ Similarly, while I admire the creativity of mirroring the Periodic Table of Elements (which I never had any problem using!) it is extremely bright and bold looking. In other words, it is not aesthetically appealing – at least not to me and to some others who even called it “tacky” -- and tends to make eyes jump all over the screen, possibly even missing the helpful links in tabs at the bottom (and mentioned above here). Just for fun, click this link to hear The NEW Periodic Table Song. although the graphics there are also not ascetically appealing. 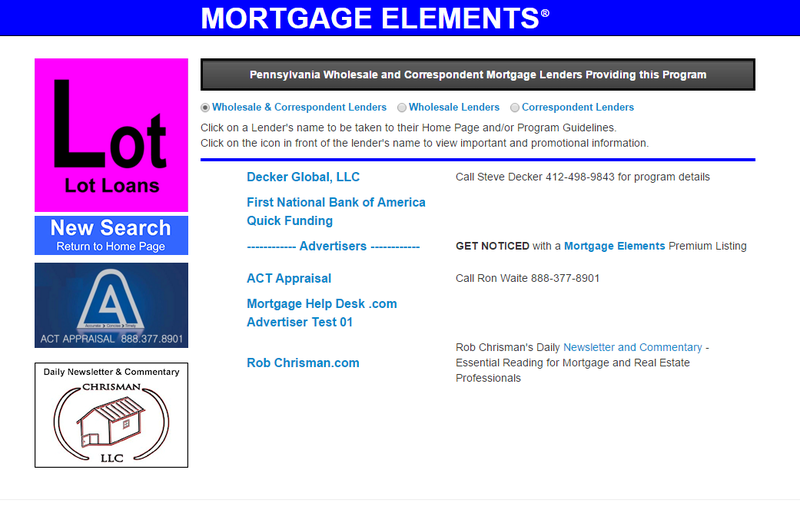 ⦁ I asked the Head of Sales at a mortgage banker his thoughts on www.mortgagelements.com. He opined that he didn’t think it was comprehensive enough. He’s fairly astute and uses technology frequently. Conclusion: either Mortgage Elements needs to get more lenders listed or they need to change the perception that some people obviously have of their thoroughness. ⦁ The bulk of the contents of the Mortgage Elements Table consists of rather “standard” products – 30 year fixed, 3/1 ARM, etc. In other words, that part of the table seems essentially useless. Similarly, the “specialty” options at the bottom seem to be missing a few and combining some that may be better listed separately and not highlighting products that many do not know exist. For example, here is the top of the page that results from choosing “Non QM” in New Jersey. 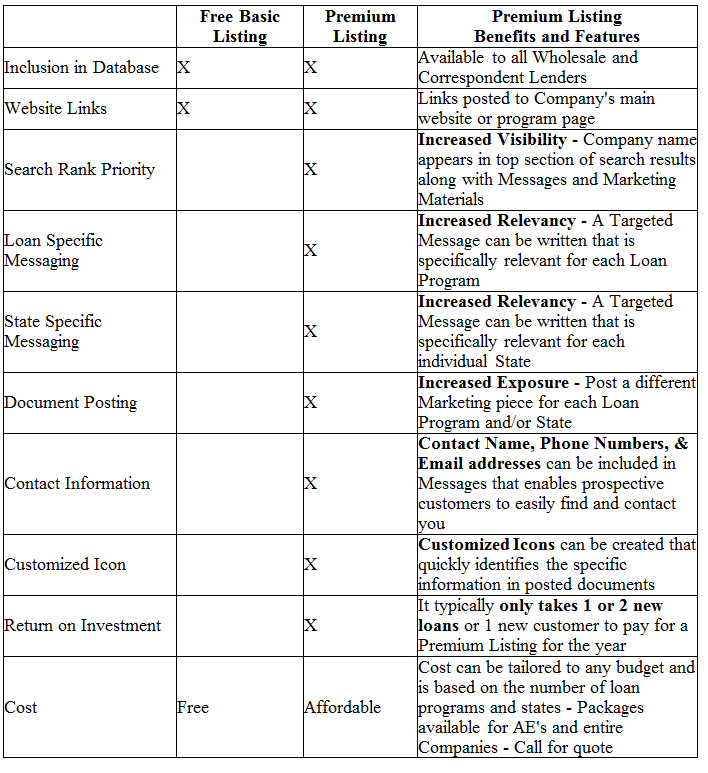 Perhaps it would be more effective to somehow highlight or note the products offered by lenders listed in the “specialty” category than just taking the user to a dump of all they offer. Better – would it be possible to include a search function that enabled the user to simply seek the exact product they wanted/needed? Choosing the “Mortgage Lenders by Product” tab in light blue further down the page, near the bottom, is a move in that direction. But clicking that does not result in “by state” or a wholesale vs. correspondent listing. Clicking on First National Bank of America yields their site. But the user needs to read the page and scroll down to find anything resembling Lot Loans, the original goal. In my consulting practice, I’ve referred this site to many growing companies and others who needed a bit of tweaking to their product offerings. In that regard it has been invaluable to increased production, enhanced employee morale, and better customer satisfaction. The table is also great to know “who offers what” in general. It provides and instant tool to help mortgage lenders learn about their competition and to better arm (pun intended) themselves against their competition. Mortgageelements.com has come a long way in a few short years. I hope they can find the partners, programmers, etc. to continue to refine this to the maximum possible value to the mortgage industry. They don’t have too far to go!